Dr. Paul Paquet, senior scientist at Raincoast writes about compassionate conservation for BC's wolves. Gray wolves are regularly held responsible for the decline of everything from large animals hunted for sport to mountain caribou and Vancouver Island marmots. In ranching country, they are conveniently and routinely blamed for putting ranchers out of business. Whether concealed under a smokescreen of wildlife management or in the name of protecting domestic livestock, chances are good that a wolf pack somewhere in British Columbia is now being (or is about to be) poisoned, trapped, sterilized, or machine-gunned from low-flying aircraft. Among the most studied of large wild mammals, wolves will always hold a special fascination for our supporters, the Raincoast staff, and me. Yet, the malevolent fairy-tale myths of the wolf persist with much of the public and the BC government continues to kill wolves as expendable scapegoats for the decline of mountain caribou. In reality, habitat loss from human activities such as roads, pipelines and logging are the main reasons for caribou decline. For wolves, there is no fairy tale ending; the continuance of these unwarranted culls means poison, bullets, choking neck snares, and death. 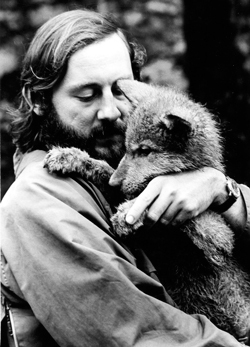 Dr. Paul Paquet holding a wolf pup in 1973. 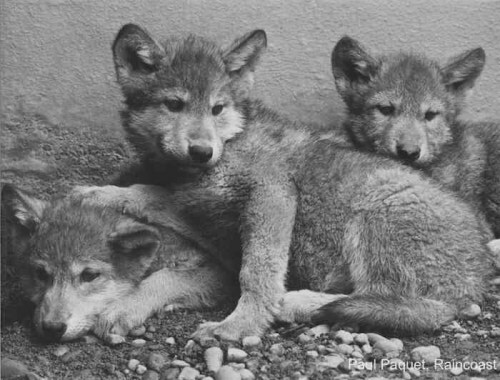 I have spent more than 40 years studying wild wolves and advocating for their acceptance and protection. My involvement with Raincoast began many years ago supervising Chris Darimont, then a young graduate student but now a university professor and Raincoast’s Science Director. Chris’s work evolved into more than a decade of groundbreaking research on coastal wolves. Recently, seminal research led by another of my graduate students, Raincoast’s Dr. Heather Bryan, documented the harmful traumas caused to individual wolves and their families by shooting, trapping, and government killing with consequences that may span generations. Although important, our science alone is not enough to advance reform of ill-informed government policies. Raincoast’s commitment to environmental ethics and animal welfare compel us to act directly on behalf of the wolves. Too often, conservation focuses solely on the maintenance of populations and their requisite habitat. We forget that wild populations are made up of individuals that can suffer the same stress and pain, which we deem unacceptable for companion animals that share our homes or those we farm to eat. Although suffering is clearly a feature of a wild life, the human-induced suffering generated by the BC wolf cull is not. We can end it if the public fully understands what is being paid for with their tax dollars. Each year the thoughtless killing is allowed to continue, hundreds more wolves will die in BC. Those that don’t die will potentially suffer injury and the stress of losing family members. Although we may never fully understand these impacts, we can easily empathize. Meanwhile, caribou will continue to disappear unless the government addresses the habitat destruction that is the real reason for their decline. Thanks to your donations, we have placed billboards on the highway approaches to the Swartz Bay and Tsawwassen terminals, major ferry routes, and transit shelters. Combined with our media outreach, we have brought the wolf cull issue to the attention of hundreds of thousands of people. Yet there is still much to do, and we need your help. For $5,000 we can raise a new billboard for six months to keep building public awareness. With $1,000, we can secure another prominent billboard for an entire month. As little as $25, $50 or $100 can help promote our messages on social media, compelling more people to act. Embracing the “domestic wolf” in my living room is a poignant reminder that often makes the issue all too real. If we can extend the care and consideration we have for our domestic animal companions to wildlife, including individual wolves, we may gain the necessary support needed to stop the wolf cull. With your support, ethical conservation can prevail. Please join our efforts and, for the wolf in your living room, donate today.